Bailey Chiropractic Centre proudly offers Vasyli Medical Molded Orthotics to High Point, Greenboro, Winston-Salem, Jamestown and surrounding areas of North Carolina (NC). Vasyli Custom is a range of heat-moldable custom orthotics designed for tailor-made biomechanical alignment. Patients enjoy fast, effective relief of symptoms at an inexpensive cost. Vasyli has over 25 years of experience and development combined to bring you the very latest generation heat custom orthotic solutions. Designed specifically for fast, easy and effective use, our unique range of orthotic products represent the very best value treatment solutions currently available for medical professionals and their patients. You can also view the vasyli custom orthotics patient education brochure to learn more about the benefits of orthotic inserts and how they can help you. Please contact our office in High Point, NC at (336) 889-8584 for more molded orthotic inserts information and pricing. 1. How long do Vasyli Custom Orthotics last? Activity and patient weight has a lot to do with this aspect. Make sure to fit the appropriate density to suit your patients lifestyle, physique etc (see "Fitting" section). As a rule, 12 - 18 months is a good yardstick. The orthtoic can be reviewed 6 monthly. If required, any reduction in the control due to compression can be restored using the rear foot medial posting. A general indicator for orthotic review is a return of patient's symptom(s). 2. Can Vasyli Custom Orthotics be reheated? Yes they can if required. However, you cannot "regenerate" the rear foot control by heat molding. That requires the use of the rear foot additions. Vasyli orthotics will not mold under body heat generated in the footwear. 3. Do Vasyli Custom Orthotics have to be worn as pairs? As a general rule, yes. The orthotics balance the lower limbs and even if pain is felt in only one foot or limb - which is usually the case - always fit a pair. 4. What if I really feel them in the arch? 5. After I went running I got a blister in my arch - what next? Patient's should wear the product to comfort before running or performing in them (see 8). For ongoing intolerance in the back or mid arch area - see Q4.. For forward arch blistering check as above AND check for a possible fore foot varus. (see "Conditions") a forefoot medial wedge may be required to prevent the medial forefoot collapsing onto the forward medial arch profile of the orthotic when the foot fully loads through mid stance phase. 6. What are they made of? Vasyli medical orthotics are made primarily of EVA (Ethyl Vinyl Acetate) a micro cellular foam used extensively in the mid sole of most quality sports footwear. The EVA has polymer additions to stabilize the material during the heat molding process and extend the wear factor. Other compounds used are PU (Poly Ethylene) and Sorbon™ (for shock absorption).The top cover is brushed nylon. 7. Do Vasyli Custom Orthotics have to be heat molded? A: Not necessarily. The Vasyli heat moldable orthotics are pre-configured for the majority of foot types. Heat molding offers the facility to "fine tune" the orthotic prescription. Feedback indicates that 80% + of practitioners find they do not need to mold them to achieve good compliance and control. 8. Should Vasyli Custom Orthotics be worn in? Yes. In general, we advise that they be worn "to comfort". Should any discomfort occur either in the feet, knees or back, then remove for a few hours or for that day and return to use the next day repeating the process. As a general rule, it shouldn't take more than 3 - 4 days before wearing all day is comfortably achieved. On-going discomfort would require a review of the prescription. 9. 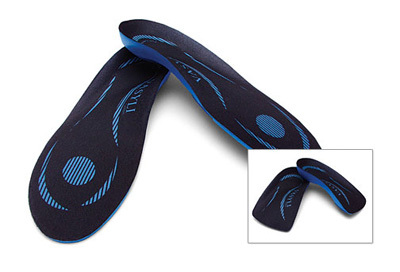 Do Vasyli Custom Orthotics fit on top of my existing insoles? No, all insoles within the footwear being fitted with the orthotics should be removed. If the orthotics are fitted on top of existing insoles it will "de-tune" the prescriptions effectiveness and may contribute to arch intolerance, as will well worn footwear. As a general rule, if the footwear has a full length insole fitted, replace it with a full length orthotic. 10. How are Vasyli Custom Orthotics cleaned? 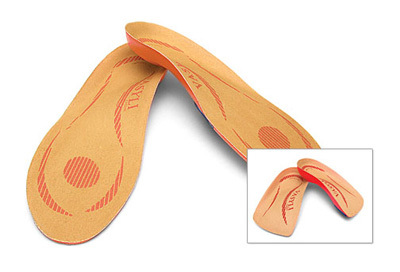 Vasyli orthotics covers are impregnated with "Footfresh"™ antibacterial / antimicrobial compounds to eliminate odour. If the products require general cleaning, wipe over with a damp cloth using a mild soap solution, rinse, towel dry and air naturally. Do not expose the orthotics to any external heat source. Do not soak or machine wash.